I was trying to save time by making rolls (same method as making green onion buns) instead of individual buns, only to find out after baking that, while I was transferring the rolls onto cooling rack, that the filling was falling out! Next time, I should use muffin cup liners for each rolls to prevent that from happening. Lightly knead the dough on a board a few times to punch out big air pockets trapped inside. Roll out to a 9×13 inch rectangle of 1/2 inch thickness. Spread milk butter filling evenly on top of the dough. 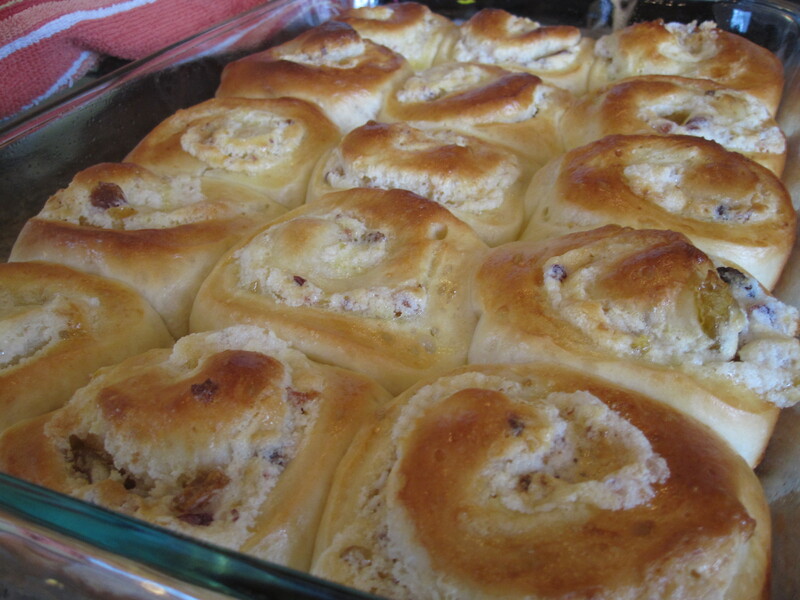 Roll the dough up like a jelly roll/Swiss roll. Pinch to seal both ends and the edge. Cut rolls into 18 even pieces. Place each roll, cut side up, on muffin cup liner then place them on a baking. Cover with plastic wrap and let it rest in the fridge overnight (see notes below). Let the chilled dough sit in room temperature for 30 minutes to 1 hour before baking. Preheat oven to 375°F. Apply egg wash on the top of the rolls. Bake in preheated 375°f oven for 15-18 minutes or until golden brown. Remove from pan and cool on a rack. Dough resting time: for 2nd resting time, 45 minutes to 1 hour is adequate. But I found resting the dough in the fridge overnight yields a much fluffier texture to the buns. Muffin cup liners: Use of muffin cup liners is recommended to prevent filling from falling out after baking. Combine all ingredients and mix well. If you are using food processor for mixing, add coconut and milk powder first to grind coconut until fine grade. Then add remaining ingredients (except raisin) and blend well. Add in raisin then pause a couple of time to coarsely chop raisin.